Excellent accueil et hôtes disposés à ce que notre séjour soit agréable. Grande propreté et lieux collectifs spacieux. Un pru éloigné du centre, 10-15 minutes à pied. I stayed in four different hostels during my holiday in Scotland and this one was definitely the best. The bedrooms and the common areas are very clean and comfortable. 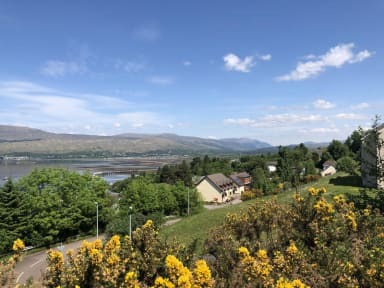 Plus, you'll have a fantastic view on the loch as the hostel is on the top of a hill (the walk to get there from the city centre is quite sporting but it is a good training if you plan to climb the Ben Nevis). If you're are looking for a quiet place during your stay in Fort William, this is the good one! Nice place. It was very cosy and a great place to rest. Sue seems nice. The room is a bit small for 4 people but the view when climbing the hill made it worth it. On the downside I regret the lack of bathroom and toilet cleaning during my 3 nights stay. Otherwise it was a good experience and I recommend it for several nights to get some rest. Thanks ! The place is alright, nothing more. Good emplacement to start many treks. The wifi doesn't work properly.